It’s a midsummer afternoon in a biology lab on the third floor of Hobbs-Sigler Hall and Mandy Larsen ‘19 is standing over a Petri dish full of termites. 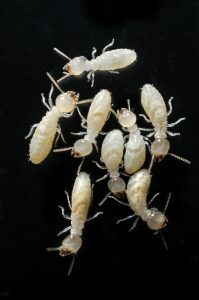 The tiny, off-white creatures are yellow-footed reticulated termites — Reticulitermes flavipes, to be exact — and Larsen has spent much of her summer trying to find out what kinds of chemicals they react to. For the past year, Larsen has been studying termites with Dr. Jürgen Ziesmann, who teaches anatomy and physiology at Lynchburg. He’s been researching the destructive little insects for three decades. “I started before I had my PhD and never fully left them,” he said. 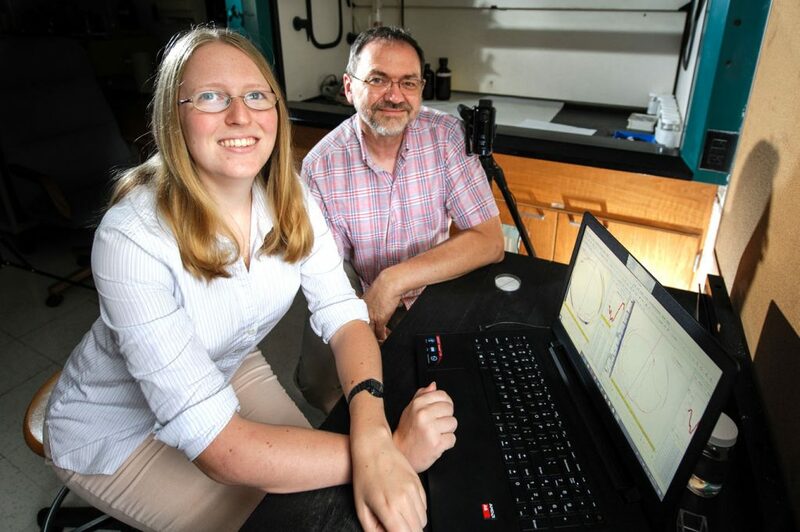 Mandy Larsen ’19 (left) and Dr. Jürgen Ziesmann are researching termites together this summer. Larsen started working with Dr. Ziesmann on a volunteer basis, one or two afternoons a week, around her classes and weekends spent with the university’s EMS squad. She even presented their research at the Eastern Branch meeting of the Entomological Society of America in March. This summer, however, Larsen’s research is being funded by an undergraduate science research fellowship awarded by Carilion Clinic and the Virginia Foundation for Independent Colleges. The $2,000 grant is given to students who are pursuing health care careers. For the past several weeks, Larsen and Dr. Ziesmann have been doing tests aimed at determining what kinds of chemicals present in decomposing wood attract termites. Termites react positively to a chemical trail. Along the way, Larsen and Dr. Ziesmann also want to find out what sorts of chemicals repel termites, which could prove useful to the pest-control industry. “In the long term, 10 years ahead, I would like to take everything I know that they don’t like and put it in the wood in my house and everything I find they really like and put it in a trap,” Dr. Ziesmann said. Before their work together is done, Larsen and Dr. Ziesmann hope to test 20 different chemicals for positive, negative, or indifferent reactions from the termites. As of late July, they had already made some discoveries. Among other things, Dr. Ziesmann said, termites are indifferent to hexanal, “what makes grass smell green,” and attracted to limonene, “what makes limes smell like limes.” He said termites also have a positive reaction to dodecanoic acid, a fatty acid used in soaps and cosmetics. Larsen and Dr. Ziesmann are using tracking software to analyze the path the termites take during testing. 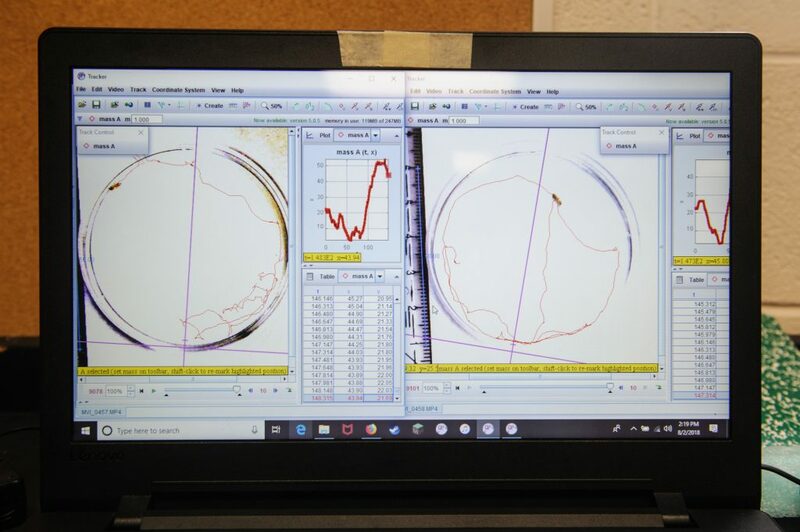 Two of the tests they’ve been doing are the “trail-following test” and “choice test.” For the trail-following test, the bottom of a Petri dish is lined with a circle of white paper and a pencil line is drawn across the center of the circle. A line of chemical, diluted with acetone, is then “drawn” across the center of the circle. A termite is deposited into the Petri dish and for two minutes, 30 seconds, an overhead video camera records what happens. If the termite walks within 13 mm of the chemical line, Larsen said, it’s deemed a “positive” result and suggests the termite is attracted to that chemical. While demonstrating the trail-following test for a visitor to the lab, Larsen remarks that the termite looks “excited.” This doesn’t escape her professor and results in some good-natured banter. “Never say it’s excited,” Dr. Ziesmann says. “Just look at those little antennas,” Larsen counters. The choice test operates in a similar fashion, except that termites are placed in a Petri dish where half of the paper lining is coated with a chemical. 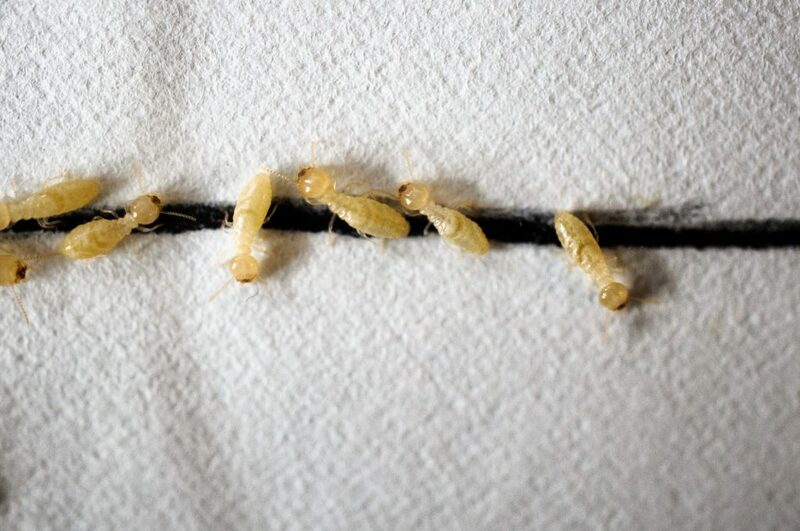 Each termite is left alone for 24 hours to see whether or not they eat the chemical side of the paper. Regardless of the reaction — positive, negative, or indifferent — the tests are repeated using lower and lower concentrations of chemical until, as Dr. Ziesmann put it, “there’s no response” from the termites. As one might imagine, this is time consuming. A single round of trail-following for one chemical takes about 2 hours and involves 24 individual termites. Multiply that times 20 different chemicals and it’s little wonder that they’ve been pondering using physiological rather than behavioral reactions. According to Dr. Ziesmann, research has shown that odorants can cause a physiological reaction in humans. “It would be cool to see that in termites, too,” he said. First of all, however, one must take the pulse of a termite, which is not as difficult as one might imagine. Dr. Ziesmann explained that termites have a “clear cuticle” — in other words, they’re see-through — so a termite’s heart can be seen contracting, albeit with help from a microscope. Similar to how Larsen might check the pulse of a human patient, you simply count the contractions for 30 seconds and multiply times two. Asked about the “average pulse of a termite,” Dr. Ziesmann said that’s difficult to say because they’ve only taken the heart rate of two termites so far. It’s also dependent on room temperature. The heart rates of the two termites they did check, however, ran about 80 to 85 beats per minute.